So, What Did He do on That Mountain? It’s often overlooked that three of the most important interests in Jesus’ ministry were education, health care and food security. And the last of these three is never seen more clearly than in the many feeding stories of the Gospels. The first thing that is important to know about the feeding stories is how significant they were in the Gospels. The feeding is the only miracle that is shared in all four Gospels, and two of them may have told the story twice. Both John and Mark have two feeding stories each. So, either (a) both of them thought the story was so important that they wanted to share it twice (which would attest to its significance to the early church) or (b) Jesus did more feeding than most of us had assumed (which would attest to its significance in the ministry of Jesus). Either possibility testifies to its importance. John’s version of the story is laden with symbolism, some of which is apparent to “normal” readers (whatever that means), and some are not. I’ll point out a few of the most important, but John starts right at the very beginning giving us interesting messages. Notice, for example, that he begins with Jesus getting off of a boat at the Sea of Galilee. All of the four gospels agree on this. 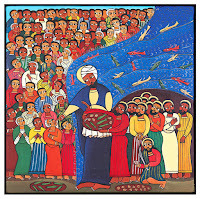 But only John adds that it was also known as the Sea of Tiberias. Why did he add that? Possibly because Tiberias was one of the most hated and politically volatile cities in Palestine, and he wants the reader to take note. It had been in existence for only a few short years. It was built by Herod Antipas in 20 c.e. at the edge of the Sea of Galilee (and recall that Jesus’ ministry was probably somewhere around 30 c.e.). It was built to facilitate trade with the gentiles who populated the opposite side of the Sea. What made it a hated name and avoided by many locals was that it was built upon a local Jewish graveyard and was therefore considered unclean to observant Jews. Only people from outside of Israel (and sellouts within Israel) would ever dare living there. Most peasant farmers had land holdings of less than six acres, of which on average only 1.5 acres was available for cultivation, hardly enough to support a family. That is, if they were fortunate enough to have saved their farms from outright seizure by the Romans, or from dispossession for tax default, or from the machinations of the Herodians and their cronies who, it is estimated, owned one-half to two-thirds of the land in Galilee. To make ends meet, most farmers either had to hire themselves out for wages to supplement their meager crops, or go into debt, which was usually a worse alternative. Tenant farmers and share-croppers often fared even worse, ending up in prison or enslaved by their creditors. When food production for the average resident of Galilee went down, it did two things. First it simply lowered the amount of fruits, vegetables, and grains that could be consumed and made the region grow incrementally more hungry. Second, and more interestingly, when such large percentages of grains were taken out of system, it made the prices of the remaining grains go up. It’s the simple law of “supply and demand”: when there is more of something the price goes down and when there is less of something it goes up. So, there was less food to go around and the food that was grown cost more to purchase for the non-farm families who didn’t have direct access to it themselves. In many ways this is a story that could be told of many poor farmers in the world today. Following the global economic “reforms” of the 1970s and ‘80s, much of the farming in poor and developing countries of the global south was forcefully reoriented from production for local consumption to production for exports. In some instances they were pushed to sell larger and larger portions of their wheat or other grains to middle people or the government which would then export it to the wealthy (usually northern) countries. In some instances they would cease food production altogether and instead grow cash crops like hemp, or cotton, or coffee. In this activity many people made--and still make--a lot of money, but the same two principles that exacerbated hunger in ancient Israel held true here as well: taking food off of the market meant that there was less of it, and what remained went up in price for low-income non-farmers. So, overall, while some people benefitted from globalization and the rise of the global “free” market, by and large the poor farmers of the world became more poor. When the ancient farmers of Israel were unable to pay the food tax, they did have access to a convenient loan program from the large wealthy land owners to tide them over—but the interest rates were often as high as fifty to sixty percent! With this precarious combination of fees and loans, whenever there was a bad harvest either from drought or unseasonable rains, many farmers would simply lose everything and have to sell their animals, or their farms, and finally their bodies as slaves to their creditors. High rates of interest were one of the key tools used for creating poverty and debt slavery in the ancient world. This too has a contemporary parallel. Leaders of poor and developing countries in the global south took out huge loans in the 1970s, under the prevailing belief that they could make enough in export sales to the north to eventually pay them back. However, in the eighties, two things came together at the same time that destroyed that possibility. First, the wealthy countries of the global north fell into a recession and cut back on purchases of the products that the poor countries were trying to sell, which drove their prices downward. Second--partly because of the recession and partly because of the US Federal Reserve tightening credit--the interest on their loans went up. In other words, while the costs for their loans was going up, their income with which to pay on them was going down. Poor countries fell into an economic abyss from which many have still not quite recovered. To keep them paying on their loans, the wealthy and powerful countries, and the multi-lateral banks that they controlled (like the World Bank and the IMF), forced them to make draconian, belt tightening, cuts in things like health care, education and price supports for the poor that many people of faith and conscience today believe to be a modern version of slavery. Tens of millions of people lost their jobs and their livelihoods (not to mention all of the merchants and services around them who no longer had customers), driving unimaginable numbers of people into hunger, poverty and starvation. In Mexico, and Central America, millions of those who fled north to the US in the nineties did so in part as a response to the economic cutbacks imposed upon their countries that devastated their local communities. In the US following the 2007-9 recession this same philosophy was used to cripple state economies in order to save them. The belief that cutting salaries, pensions, benefits, social services and jobs to pay off loans would somehow result in growth—was imposed on state and local governments in the US and the poorer countries of southern Europe. The belief was that if you can just fire enough people and cut enough salaries, pensions and benefits, and cause enough suffering and hunger, then it will miraculously lift the economy and promote business and trade. That theology is not totally wrong. In the long, long, long, long, term, perhaps, but in the short run the reverse nearly always happens. In the Third World cuts of the eighties, it took over twenty years of brutal human suffering before the economies began to claw their way back. When people’s incomes and salaries are cut, they begin paying less in income taxes and sales taxes and the government’s deficit actually goes up, not down, resulting in calls for more and more rounds of cuts. It was and is a downward spiral that almost always ends badly. Like in the poor countries stricken by this policy in the eighties and nineties, and countries like Greece today, massive cuts and firings have been the biggest drag on the global economy and the major force dragging on the recession. In Europe the horrific cuts in social services and livelihoods has driven countries like Greece into such poverty that it will take generations before they ever claw their ways back. Though our contemporary examples are different, they are in many ways similar to the demands imposed on small farmers in ancient Israel by Herod Antipas and large land owners. All of this background is tied closely to the feeding story and is related to why the author of the Gospel of John wanted you to know that this took place close to the hated city of Tiberias. Have you ever wondered why it was that so often when Jesus was in the country side he was swarmed by great crowds of people? Where did they come from? When he is in the towns, you may not see them by the thousands, but there are still hoards flocking after him. Even allowing for some exaggeration from the Gospel writers, it still is an interesting phenomenon. Where did they come from? These stories were for the most part in the middle of the day. Don’t they have jobs? The answer is “no.” These were people who were driven off of their land by poverty and hunger and oppression by their rulers. They often were not able to pay the demanded tribute and feed themselves at the same time and got desperately into debt and finally lost their farms. Some in fact moved back onto the farms they once owned as indebted workers; many others just became homeless, beggars, prostitutes, thieves, and day laborers. When they heard of Jesus, teaching, healing and feeding in the region or neighborhood they flocked to see him. 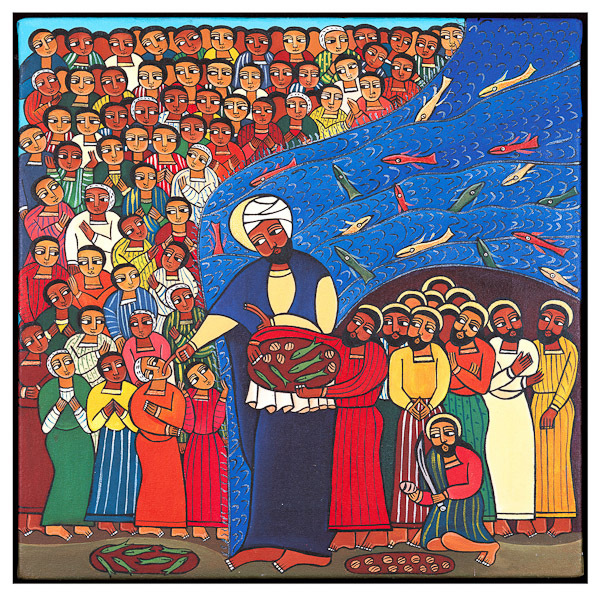 And when he got out of the boat at the beginning of our story, and the crowds saw him, they clamored for him, wanting to see or experience some of the healing signs that they had heard were taking place through him. Another seemingly innocuous comment from John is that all of this took place near the Passover. There is nothing in the story as it stands that otherwise refers to, or relates to, the Passover, so why did he think it was important to mention that here? Part of it was likely because he wants the reader to think of Jesus as a new Moses, who you will recall also delivered bread (manna) from a mountain (Exod. 16:4, cf. John 6:31-33). But it is also likely that John once again wants us to feel the politically charged atmosphere surrounding this event. In a fairly consistent way, whenever John makes note of an event being close to a Jewish festival, he has Jesus present some kind of controversial teaching that subverts and undermines a traditional teaching that is held by the religious authorities, and the result is often a confrontation with those authorities (cf. 1:13ff; 7:2ff; 10:22ff; 12:1ff)” While in this instance the religious authorities do not show up until after the feeding story, the provocative, confrontational nature of the feeding is nonetheless clear here as well. Here is where the story gets very interesting (I bet you thought it was interesting already). When the crowd comes up the hill toward Jesus and his disciples, he leans over to Philip and asks, “Where can we go to buy enough bread to feed these people?” John says that he already knew the answer to that question when he asked it, but he did it anyway to see what Philip would say (v. 6). And Philip comes up with the straightforward economic reality: No place. Nowhere. It’s impossible. To feed these people, he says, would take six months of wages, and nobody--certainly not the rag tag crowd that followed Jesus--had that kind of money laying around. Even if Judas had not been skimming donations from the till, they still couldn’t do it. Six months wages (or eight or ten, depending on the various translations) are actually just guesses. In the Greek it says two hundred denarii. A denarius was a Roman coin equal to about one day’s wage for a desperately poor common laborer. Philip is saying it would take two hundred days worth of work to feed these people (though the value of money at the time was falling). His precision is interesting. Why not be more general as numbers often are in the Bible? My hunch is that in addition to just simply saying that this is a big chunk of change, it is likely that Philip is also expressing his exasperation about the outrageousness of the decline in the value of coins in his day, and the rapid escalation in prices. He is probably making a statement about the impossibility of buying food to live on in an age of stagnating wages and inflationary prices. And if that is what he was doing, he was certainly correct. As an aside, I also find it interesting that Jesus asked the “where” question, “Where are we to buy bread for these people to eat?” But Philip only hears a “how much” question: “How much will it cost to buy bread for these people to eat?” Jesus’ question assumes that they will buy bread, and can buy bread. Philip’s answer makes it clear that he doesn’t think so. He thinks that they can’t buy that much bread, no matter where the bakery is. Jesus responds to this in a very odd way, but before we get to it, let me say what Jesus did not do. He did not offer communion. That is, when he took the loaves, broke them, gave thanks, and gave them…, he was not imitating some form of pre-communion, even though the Gospel writers, writing many years later, certainly had that in mind, and even though approximately 487.09 gazillion preachers (more or less) have later said he did. Whatever else he was thinking of up there on the mountain, it is all but one hundred percent certain that Jesus did not have the Celebration of Holy Eucharist on his mind while he was breaking bread and handing it out to hungry people. If he did, what would have been the point? The crowd that gathered there on that day would have had no idea what he was talking about. He could not have been trying to do some symbolism to tens of thousands of strangers of an event that had not even happened yet. Almost every Bible scholar on the planet (with the possible exception of my pet squirrel, but his credentials are a little weak) believes that the Gospel writers retrofitted that theology back into the actions of Jesus later because that was what they were thinking about, not Jesus. So, now what was Jesus thinking? If the account can be accepted (and of course, that always carries some degree of conjecture), he was looking out onto a sea of faces, all poor and almost all hungry. They represented a wide swath of the economic and social bottom of Israelite society of the day. They were probably far more than 5,000 people, because in those days they only counted men, not women and not children. So a good guess would be at least ten thousand, perhaps as many as twenty. Again, this is if the crowd estimates can be accepted, but by any accounting it was an incredible number of people. Look again at the four acts described before the actual feeding itself: he “took,” “gave thanks,” “broke,” and “gave.” While these probably are not images that prophesy upcoming Holy Communion, they are images that hearken back to traditional Hebrew gestures of a gracious host welcoming guests to his banquet table (except that Jesus’ guest list was a bit larger than that of most of us). Think about the first two words, “took” and “blessed.” These are welcoming acts, and in a typical first century Jewish family, these are the acts of hosting. They bring you into the family. The last two, “broke” and “gave” are acts of serving and they are acts done usually by a slave (or worse: a wife). 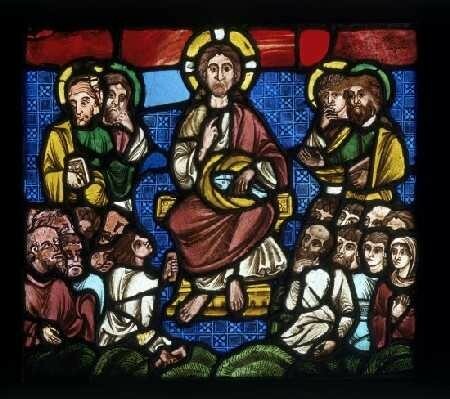 Notice too that before Jesus either welcomes or serves, he has everyone in the crowd “recline” (anepeson), which is the posture one takes in a banquet, not an ordinary meal. To recline means that the host has to lean down to serve you. It is also the posture that Jesus takes later in his last supper, when he also serves. In doing this, Jesus in a subtle, almost radical, way has symbolically taken on the role of both master and slave, husband and wife, teacher and student, and welcomes everyone to the table. When he does that, the participants almost certainly realized that something very special was about to happen. So far, he is doing two things. First he is embodying the majestic vision of the “messianic banquet” of the Hebrew prophets. And they, in turn, were envisioning the “Jubilee,” that great age heralded in Leviticus 25, when all of God’s creation, which has been broken and disfigured by human corruption and greed, will be returned back to the harmony and justice that God had originally intended. 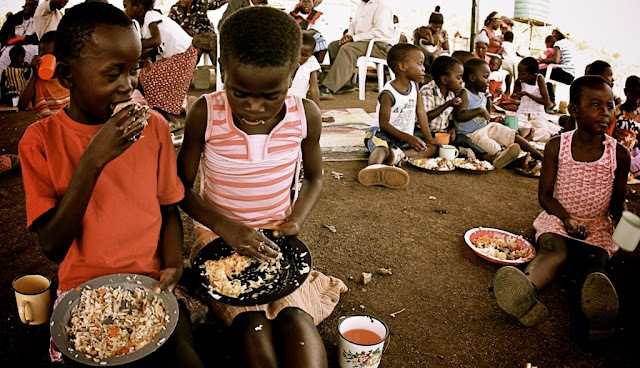 In the Jubilee, the days of God’s final dispensation, a celebration of oneness and equality will break out all over the land, and it will be symbolized by the one thing that almost all poor people lacked: food. There will be a great and glorious banquet on the mountain tops, which will be attended by all who can walk or crawl (and some who can do neither). Most significant for a Christian interpretation of this act is that throughout his ministry, Jesus many times—here included—acted as though he was embodying the vision of the banquet. He acted it out in his behaviors with others and embodied its salvific meaning. His expansive, sharing, welcoming style had in fact garnered for him a reputation as a “glutton and a drunkard, a friend of tax collectors and sinners” (Mt 11:19). It was considered a criticism by his enemies, but to his supporters it was actually a beacon of what God intended for the earth. He “welcomes sinners and eats with them” (Luke 15:1–2) and in so doing he becomes God’s magisterial welcome mat to sinners (which, we should remember, included people who were sick, contagious, old, non-Jews, immigrants, criminals, slaves, and women) to enter in and become a part of the true end for humanity, the “kingdom” of God. An important link to the events of the Last Supper is that in that meal, not only was he pointing backward to this feeding story, but he was also pointing forward to the coming eschatological banquet. He said, “I will never again drink of this fruit of the vine until that day when I drink it new with you in my Father’s kingdom” (Matt. 26:29; Mark 14:25; Luke 22:18; cf. Luke 22:28–30). It’s very likely that what happened was something like this: Jesus took the little boy and he set him in front of the crowd and said, “Hey, hey, all of you. Listen up. Look up here, focus, focus. Okay. Now I know that all of you are very poor. All of you have felt like you have been caught up in the economic crash that drove up the prices of food and drove down your income. We all know that. And all of you are afraid that you don’t have enough even to survive on your own and you’re afraid to spend anything. Now, I’m not going to give you some long lecture about Keynesian economics and how major financial powers need to step in and invest and spend and loan until the smaller folks can get their faith and trust and security back. Rome may get around to something like that one of these days, but who knows. Until then, we’re going to try something else; something that might be a model for the government and might work out better for you in the long run; something that might actually bring in the Kingdom that I’ve been talking so much about. I’m going to put this little kid out in front here—with his frankly pretty dismal offering—for all of you to look at. He’s saying he is offering to give us everything he’s got, and I want you to see that. And then I’m going to break up his smelly bread and give thanks to God for it, and then start distributing it to all of you, and then you will…well, I don’t know. Let’s see what happens after that. Alright? Got it? Don’t let me down. So now bow your heads I’m going to pray” and he starts praying. And then, I think, as the bits and pieces of food are handed down the aisle, one person starts to think to himself, “Y’ know, the wife did make me this sandwich and packed me this thermos of coffee, and I probably don’t need all of it, so I’ll break it in half and pass it down with the barley as it comes handed down the aisle to me.” And then the next guy says, “Well, I do have this banana that I forgot to check at the gate when I came in, and I don’t need all of it,” so he breaks it in half and passes it down. And then there’s the guy who picked up the box of Oreos at the Seven Eleven that morning on the way out of town to the rally. And the one who won the turkey at the meat raffle at the Grange meeting last night. And the one who remembers he still has a piece of that fruit cake left over from the office party a couple of years ago that never went bad. 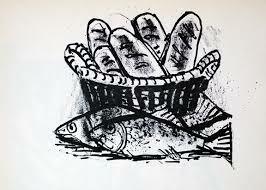 And so on, all down the line, until all the loaves and fishes had been passed around and the disciples gathered up the scraps and found twelve baskets full of leftovers and snacks. Goodness. Now that would be a miracle! The list is probably slightly exaggerated, but close enough to make the point. Obery M. Hendricks, Jr., The Politics of Jesus: Rediscovering the True Revolutionary Nature of Jesus’ Teachings and How They Have Been Corrupted (Doubleday, 2006) p.
 It would take far too much space to develop this theme, but it is essentially true that until relatively recently (the Reagan/Thatcher administrations), it was considered basic “Econ 101” that you spend money during a recession because the economy needs more money and you paid it back during boom times because then the economy has more money. The idea of cutting spending when the economy is in recession and desperately needs money to survive is a relatively new notion and somewhat like bleeding a hemophiliac and expecting it to make him get well. See Amy Jill-Levine, “Visions of Kingdoms” The Oxford History of the Biblical World, Ed. Michael D. Coogan (Oxford University Press: 1998), p. 364. “Jesus Doesn’t Use IVR!”, Homiletics, vol. 18, no. 4, July 2006, pp. 41-46. The Denarius (from the Latin dēnī, “containing ten”) was a silver coin originally minted as the value of ten asses. However, during the reign of Caesar Augustus (63 bce –14 ce), it had steadily declined in value to where, by the time of the ministry of Jesus, it had shrunk to nearly half its original size and purchasing value in asses. Unsurprisingly, in Israel all of the people forced to work on the massive government jobs were paid the same salaries decade after decade, even as the value of the currency was falling. Other references to denarii in the Gospels: Matthew 20:1-2; John 6:5-7; John 6:5-7; Luke 10:33-35; and John 12:4-6. Actually the Synoptics say “blessed” (eulogēsen) and John’s Gospel says “gave thanks” (eucharistēsas), but the difference is not great enough for our purposes here to quibble. In the words of John Dominic Crossan, “Long before he was the ‘host,’ he was the hostess.” The Historical Jesus: The Life of a Mediterranean Jewish Peasant (HarperSanFrancisco, 1991), p. 404.